Linking up again with the lovely Hallie today. As every good workout video goes, "let's get started!" 1. I'm a tiny bit star-struck because not only did Cari try my pizza combo, she loved it, and blogged about it. You should take her advice (and mine) and make yourself a caramelized onion, balsamic reduction, goat cheese pizza. And if you like it, and feel like you can trust me, you should also try kalamata olive tapenade and parmesan as another combo, if olives are your thing of course. I'm sure you can buy pre-made tapenade, but really if you take pitted kalamata olives, capers, garlic, lemon juice and olive oil and give them a whirl in a food processor, you're good to go. Full disclosure: both of these pizza combinations comes from this cookbook which was very thoughtfully given to me by friends who knew this midwestern carnivore was marrying a vegetarian. Now that Mark has seen the error of his ways, I don't use the cookbook as much any more, but these pizza combos and Mollie's corncakes have earned it a permanent place on the shelf. 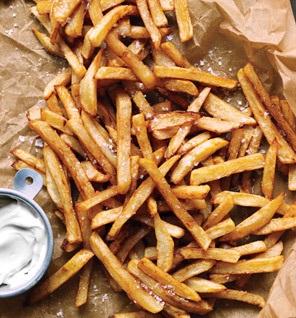 Onto more favorite food items, someone on Pinterest did me a solid and pinned Gwenyth Paltrow's No Fry Fries. They are delicious and only 175 calories a serving. I hate myself a little bit for including nutritional facts, but when you love potatoes as much as I do, and are working with a nutritionist who recommends between 1200-1400 calories per day, this is vital information. Make them today. You'll be happy you did! My brother is finishing up an 8 week training course in Houston this week, and to celebrate we are taking him here. It's one of our favorite restaurants in Houston. The building is one of the oldest in the city, and no one in the city makes classic mixed drinks better than they do. I've spent my day trying to decide if I should order a Gin Gin Mule, a Sazerac or the smoothest Manhattan you've ever sipped. Did I mention it's a school night? Our projection alarm clock. Hear me out on this one. 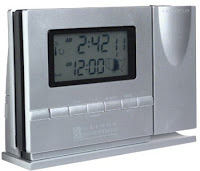 It projects the time and temperature on the ceiling. Maybe not a necessity, but it does mean no fumbling for your phone in the dark when you are trying to decide if you really do need to get up and go to the bathroom. Because, honestly, why would you when you only have 15 minutes left of precious time in bed? Now, if there's enough time for you to fall back asleep, that changes the story. And so you see why I think this clock is amazing. It also tells you the temp of your room which is helpful when debating with your husband who refuses to believe that the room is actually cold. Teacher catalogs! Next year, I'm returning to full time teaching and will have my own kindergarten classroom, which means that between now and the end of the year, I'll be choosing supplies to order and designing bulletin boards and all the fun parts of teaching (mostly kidding). Construction paper, glue sticks, crayons, oh my! Congrats Anne!!! I am actually teaching part time next year... and very excited!! I need advice! Hello? I am SO BUYING THAT COOKBOOK! And we're getting all the teaching supply catalogs here, too, but instead of making me excited, it's just freaking me out because it means that I'll have a 7th grader in the house next year. I don't know how that happened. I want that alarm clock! I got it for Christmas one year but the thermometer didn't work! I never looked into replacing it- we just returned it. Clocks keep breaking in our house. It's horrible! How exciting that you will be teaching! I will be using you as my kindergarten source of wisdom because that age group completely baffles me.